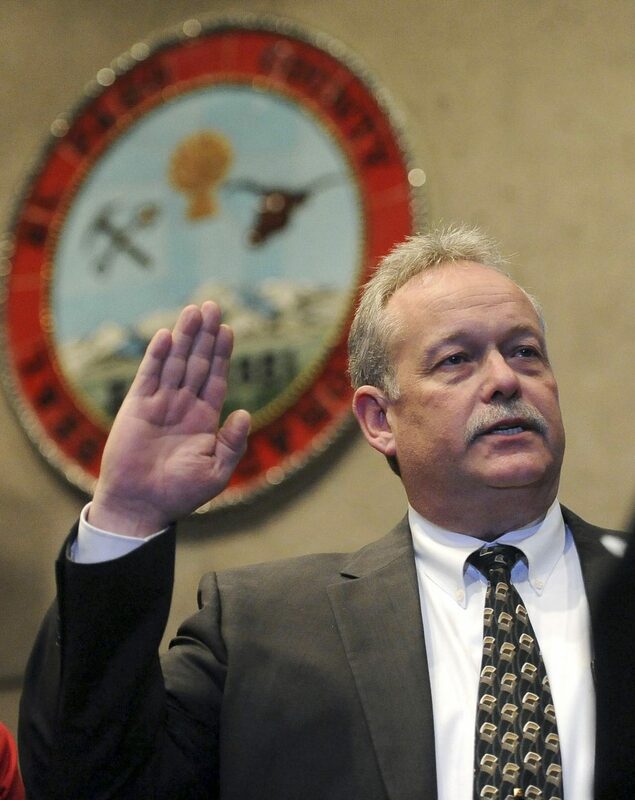 FILE - In this Dec. 31, 2014 file photo, Bill Elder is sworn in as interim sheriff of El Paso County by Judge Gilbert Martinez at Centennial Hall in Colorado Springs, Colo.
DENVER — A Colorado sheriff’s department is improperly holding people suspected of being in the country illegally on behalf of federal authorities, according to a lawsuit filed Tuesday by the Colorado American Civil Liberties Union. After inmates suspected of being in the country illegally have been ordered released by a court or served their sentence, the suit says Elder’s department files a form indicating they are now housing the inmates on behalf of the federal Immigrations and Customs Enforcement. Courts in several states have ruled that sheriffs cannot hold people on behalf of U.S. Immigration and Customs Enforcement without violating the 4th Amendment against unreasonable search and seizure. In 2015, following a settlement with a suburban Denver sheriff’s office, the ACLU announced that all Colorado sheriffs other than Elder had agreed to no longer honor ICE “detainer” requests. The Trump administration has begun a test program in Florida in which they contract with local jails to hold immigrants using the same paperwork as in El Paso County. It’s an attempt to get around the legal obstacles courts have erected to sheriffs assisting with immigration enforcement. It is exploring rolling the program out nationwide. Elder said in a statement that his agency is simply following the same procedures it established in 2007 when it signed a contract to assist ICE. “Make no mistake, we have and will continue to fully cooperate with Immigration and Customs Enforcement,” the sheriff said.